Scientists and patients come together to deliberate on the disease and its effects on the Lebanese population. According to LAU professor, three percent of food labelled as gluten-free is in fact contaminated. 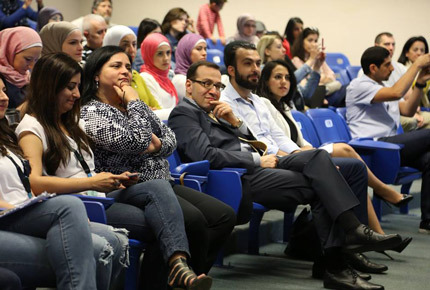 On May 28, LAU’s Nutrition program of the Natural Sciences department held a scientific meeting at the Beirut campus in cooperation with the Lebanese Celiac Association and AUB medical experts to increase awareness of celiac disease in Lebanon. Highlighting its pioneering aspect, the scientific venue titled ‘Celiac Disease from Another Perspective’ offered a platform for members of the medical community, dieticians and patients to discuss this physical condition and its effects on the Lebanese population. Gluten is a protein which is found in wheat, barley and rye. In the case of patients suffering from celiac disease, when gluten is ingested, an enzyme called tissue transglutaminase modifies it into a chemical causing an immune response that inflames the lining of the small intestine. For this reason, a special gluten-free diet is needed. In the second part of the conference, ‘Celiac from Nutrition and Food Science Perspectives’, Maya Bassil, assistant professor of Human Nutrition at LAU, discussed the importance of following a strict gluten-free diet for celiac patients, while addressing the misconception that the diet is beneficial for the overall population. Interestingly, she pointed out that the hype created by marketing gluten-free products as healthier, or as an aid to weight loss, is misleading and incorrect. Hussein Hassan, assistant professor of Food Science and Technology at LAU warned that “three percent of food labelled as gluten-free is in fact contaminated.” The importance of avoiding food trans-contamination and the rules to be observed while eating out were some of the practical issues discussed by Sally Haber, a clinical dietician.